Rajasthan election 2018: The Election Commission said that Ramgarh seat in Alwar, which was cancelled due to death of BSP candidate, will be announced shortly. As 4.74 crore registered voters cast their votes in Rajasthan, the overall poll percentage in Rajasthan has been 72.62 per cent, where elections were held today for 199 of the 200 assembly seats. The Election Commission said that Ramgarh seat in Alwar, which was cancelled due to death of BSP candidate, will be announced shortly. The BJP facing a major challenge as the northern state has always voted out the incumbent government for more than two decades. Chief Minister Vasundhara Raje, however, is looking to hold on to power by riding on her government's schemes and the work it has done for the people of Rajasthan. After she cast her vote this morning, Ms Raje expressed shock at Bihar politician Sharad Yadav's comments body-shaming her at an election rally and said the Election Commission must act. The Congress is counting on anti-incumbency to win in Rajasthan. In the last round of by-elections in February, the Congress wrested the Ajmer and Alwar Lok Sabha seats and the Mandalgarh assembly seat from the BJP. The votes for Rajasthan will be counted on December 11 along with Mizoram, Madhya Pradesh, Telangana and Chhattisgarh. 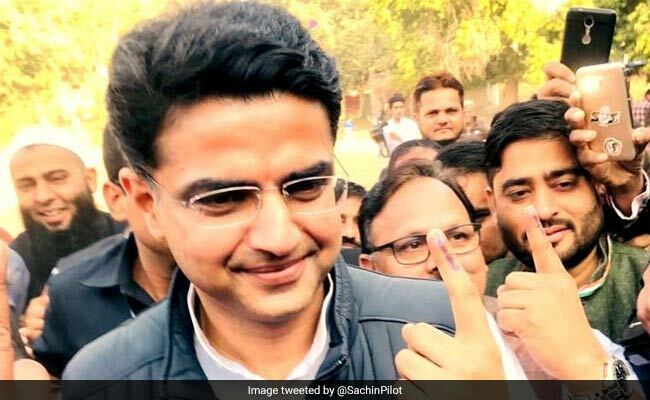 Moments after casting his vote for the Rajasthan Assembly elections in Jaipur, Congress leader Sachin Pilot stated he is confident that his party will sweep the elections by bagging majority of the votes. Answering a question on Congress' chief ministerial candidate, Mr Pilot quickly replied, "We will sit and discuss this after our party gets a majority in the election." "Every single vote is imperative to strengthen the democracy of the country. I urge all the people to think before they use their franchise for any particular quarter. They must cast vote to that party which has worked for Rajasthan's upliftment," Mr Rathore said after casting his vote at the Vaishali Nagar polling station. Mr Rathore was accompanied by his parents and wife Gayathri Rathore. Senior Congress leader and former Rajasthan chief minister Ashok Gehlot on Friday said that his party will win with an absolute majority and form government in the state. "Certainly, the government will change this time. Congress will form government in Rajasthan with absolute majority. People of the state have the same sentiments. BJP will win around 50 seats," Mr Gehlot said. The polling, which began on a dull note at 8 am, picked up speed in the last two hours. Voting will continue till 5 pm. Long queues of voters, including women, were seen, especially in rural areas. 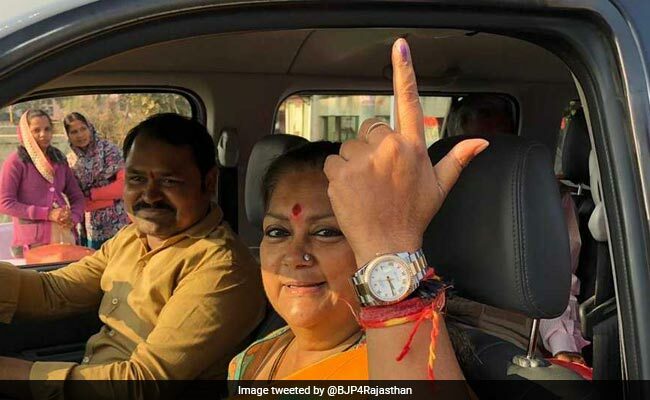 Rajasthan Chief Minister Vasundhara Raje shows her inked finger after casting vote at Jhalawar seat. The results of the Rajasthan assembly election will be out on December 11. 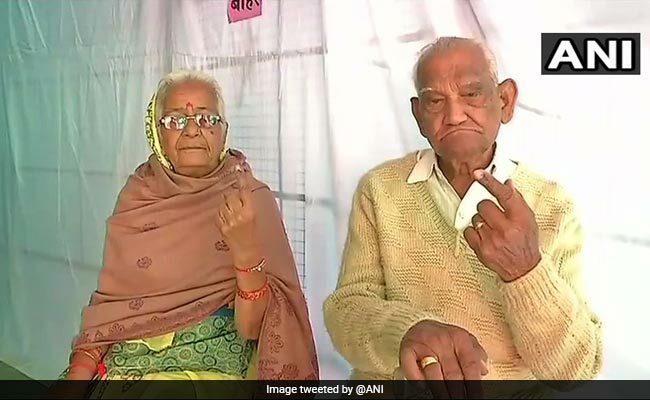 97-year-old Nagender Singh Chouhan and his 85-year-old wife Yuvraj Kuwar cast vote at a polling station in Jhalawar. Shajha, a 105-year-old woman, casts her vote at a polling booth in Kishanpura, Jaipur. "There is no facility of wheelchair in this polling booth. We had to carry her inside the polling station so that she could vote" her family member said. A voter turnout of 22.2 per cent was recorded in Rajasthan till 11 am. "As a woman chief minister, casting my vote at a pink polling booth run completely by women gives me a great sense of pride. I urge you all to go out and vote, celebrate your identity and exercise your right," Chief Minister Vasundhara Raje said. 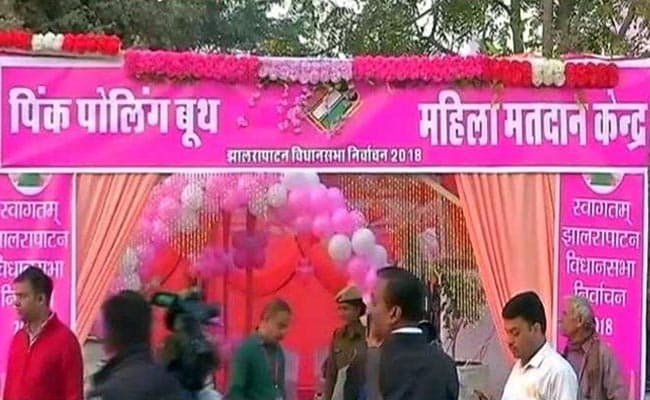 Decorated with pink and white balloons, the women's polling booths are a new experiment by the Election Commission to help increase the participation of women in the electoral system. "We are seeing that women's participation is increasing in all sectors -- be it government or private. So we wanted to experiment with stations managed exclusively by women. 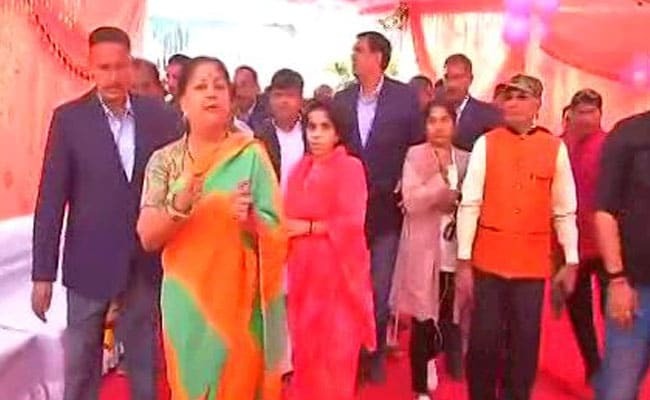 Going forward, we would want more and more such pink booths," said an election officer from a pink booth in Jhalrapatan where Chief Minister Vasundhara Raje voted this morning. "Is this the sort of example he wants to set for youngsters? Congress and its allies should be restrained in their language," Rajasthan Chief Minister Vasundhara Raje said on the comments by Bihar politician Sharad Yadav that was seen as body-shaming the chief minister. The BJP in Rajasthan has complained to the Election Commission after Mr Yadav's outrageous comments last Friday in Alwar. Union Minister of State for Agriculture Gajendra Singh Shekhawat casts his vote at polling booth No. 128 in Jodhpur, Rajasthan. A 90-year-old man arrives at polling booth No. 104 in Sardarpura constituency of Jodhpur district to cast his vote. Rajasthan Home Minister Gulab Chand Kataria casts his vote at a polling station in Udaipur. The Rajasthan assembly has 200 seats, but election in Alwar district's Ramgarh constituency has been put off due to the death of Bahujan Samaj Party candidate Laxman Singh. "More than two lakh electronic voting machines (EVMs) and verifiable paper audit trail (VVPAT) machines will be used in the elections," chief electoral officer Anand Kumar said on Thursday. He said it was for the first time that VVPAT machines are being used in Rajasthan. "We will sit and discuss this after our party gets a majority in the election," Congress leader Sachin Pilot said on who would be the chief ministerial candidate for the party in Rajasthan. In Tonk, Sachin Pilot and Rajasthan Transport Minister and BJP candidate Yoonus Khan are face to face. Mr Khan is the only Muslim candidate fielded by his party. Ashok Gehlot is fighting for the Sardarpura seat. The polling caps a hard-fought campaign between the Congress and the Bharatiya Janata Party (BJP). Union Minister Rajyavardhan Singh Rathore casts his vote at polling booth No. 252 in Vaishali Nagar, Jaipur. 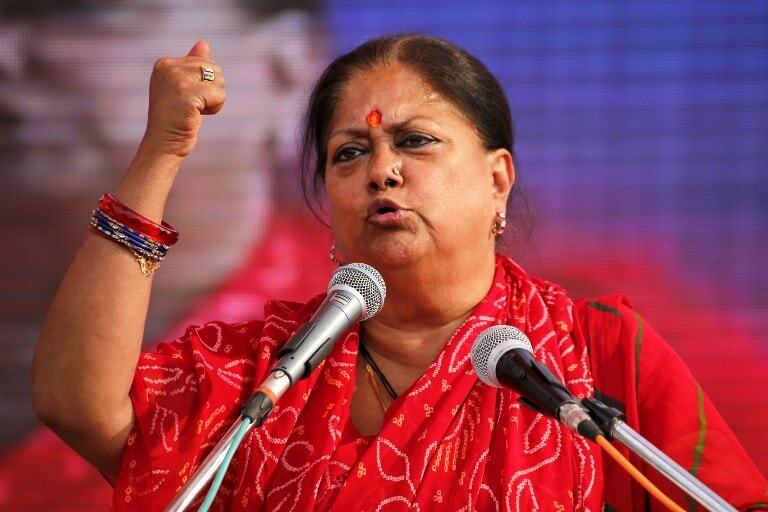 Vasundhara Raje formed the Rajasthan government with a massive majority in the 2013 assembly elections, in which the BJP had won a record 163 seats and the Congress could get just 21. The BSP had got three seats, while independents and candidates of other parties won 13. "I am extremely shocked," she said on Bihar politician Sharad Yadav's comment on her weight that was seen as body-shaming. "It is very important that Election Commission takes notice of the remark. I feel insulted. 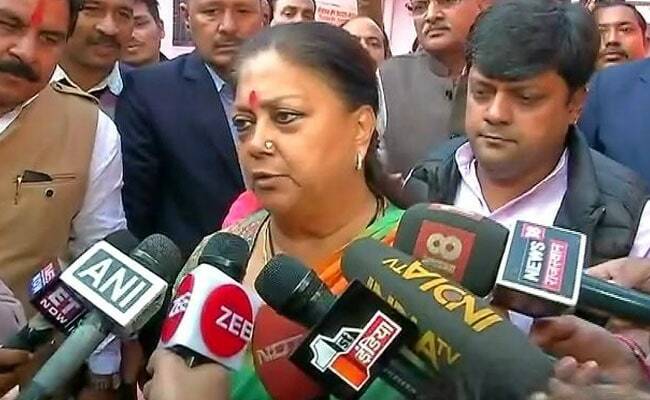 Women are insulted," Rajasthan Chief Minister Vasundhara Raje said after casting her vote at pink polling booth No. 31A at Jhalrapatan constituency in Jhalawar. The "pink polling booth" is for women. 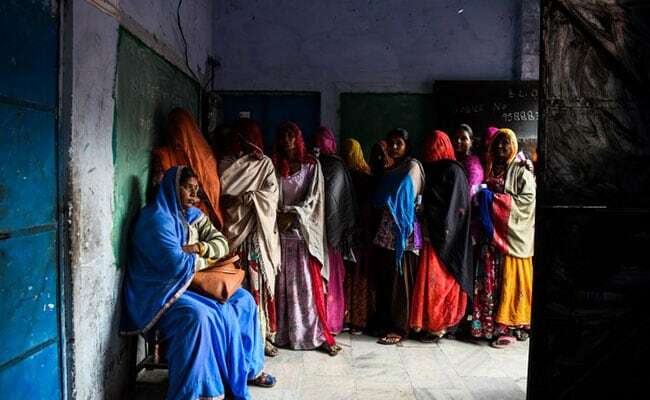 In the last assembly elections in Rajasthan, the turnout of women voters was 1 per cent higher than men. 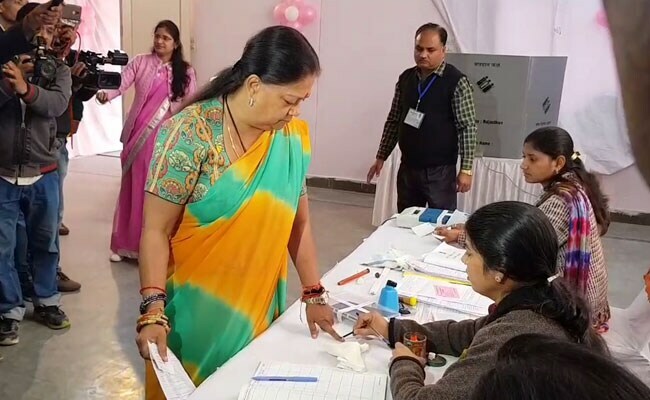 Rajasthan Chief Minister Vasundhara Raje of the BJP is scheduled to cast her vote at 8:15 am for the Rajasthan assembly election. She is counting on her government's programmes to fetch her a large number of votes, enough to keep her in power for another term. The Congress is hoping anti-incumbency will work in the northern state. Mock polling being conducted at booth No. 106 in Jodhpur's Sardarpura constituency. Voting for the Rajasthan assembly election will start at 8 am. Election official prepare to receive voters at a polling booth in Jodhpur. Voting for the Rajasthan assembly election will start at 8 am. The counting of votes will take place on December 11. The results of three other states - Madhya Pradesh, Chhattisgarh and Mizoram - will be announced on the same day. The Congress is yet to announce a chief ministerial candidate in Rajasthan. Its election in-charge Sachin Pilot and former chief minister Ashok Gehlot are seen as front-runners for the top job if the party wins. Voting in the Rajasthan assembly election will start at 8 am. A "pink polling booth" in Jhalawar. Heavyweight candidates from Congress include State Chief Opposition Leader and famous Jat leader Rameshwar Lal Dudi from Nokha, State Party Chief Sachin Pilot from Tonk, Former Chief Minister and State General Secretary of AICC Ashok Gehlot from Sardarpur, Senior Congress Leader and former Revenue Minister Hemaram Choudhary from Gudha Malani, State Vice President and former Cabinet Minister Mahendra Jeet Singh Malviya from Bagidora, Former State Home Minister Shanti Dhariwal from Kota and Son of Jaswant Singh and former MP Manvendra Singh from Jhalrapatan. From Bharatiya Janata Party (BJP), State Rural Development Minister Rajendra Rathore from Churu, State Party President and Mayor of Jaipur Ashok Parnami from Adarsh Nagar, State Women and Child Welfare Minister Anita Bhadel from Ajmer South, State Home Minister Gulab Chand Kataria from Udaipur, and Chief Minister Vasundhara Raje from Jhalrapatan are the prominent candidates. In the last five elections since 1993, Rajasthan has swung between the BJP and the Congress. But the Congress, which won only 21 assembly seats in 2013 against the BJP's 161, would need an 8 per cent swing in its favour to win the election. A "pink polling booth" at Jhalawar in Rajasthan. Voting for the Rajasthan assembly elections will start at 8 am.